Gold has been around for centuries. It sparked gold rushes in the US and abroad, sent people scrambling for wealth, and has been the basis for determining monetary value–and it’s also prized in the world of jewelry. As Investopedia reports, it was even the very start of the US currency system in 1792, when all money had to be backed by gold. Though we’ve come a long way since those years of the gold standard, investing in gold is still a common practice. It’s never too late to start buying gold as an investment. With the current economic situation, inflation, currency debasement, and banks in distress, it makes sense to smartly invest in this traditional form of wealth and worth. Gold is protection, your insurance against global uncertainty. It weathers inflation well, maintains its value, and becomes worth more every year. Yet figuring out how to get started and build an investment portfolio that includes gold is difficult. Unlike today’s online investments, digital stock tools, and invisible money, gold is a real commodity and, sometimes, a physical purchase. Don’t worry–buying and investing in gold is easier than you think. Here are 5 great ways to invest in gold to get you started. Gold bullion is recognized by two classifications: it’s gold that’s 99.5% pure, and it’s also legal tender. 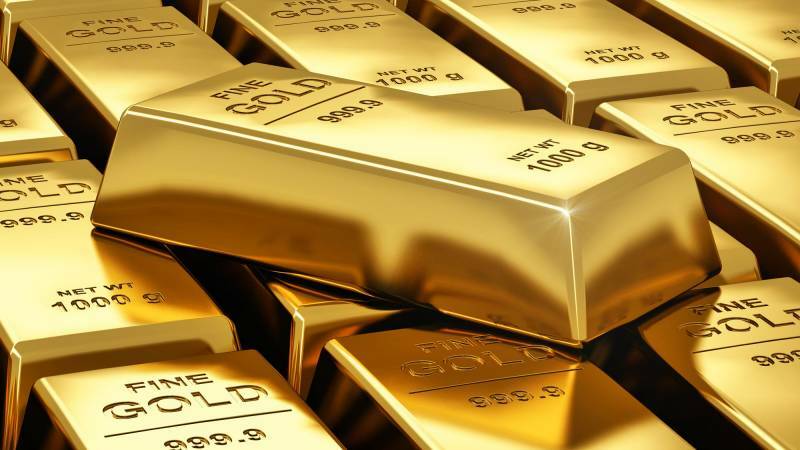 Long a popular way to invest in gold, buying gold bullion is the act of buying physical gold. No matter how you buy it, in the form of gold bars, jewelry, or ingots, it’s still the same investment. Unless you want to trade gold actively, it’s always better to buy physical gold bullion. First of all, it’s easy to buy. You just need to buy it from a reputable gold dealer (if you’re buying bars or bullions) or jewelry store. Secondly, the cost of investing in this form of gold is nearly as low as various “virtual gold” alternatives. Don’t want to deal with the hassle of storing physical gold? Opt instead for a gold exchange-traded fund, or an ETF. Gold exchange-traded funds are backed by gold, but they do not allow you to own physical gold. A gold ETF allows you to place gold in your investment portfolio and reap the benefits of physical gold’s value without worrying about genuine gold. If you want to one day cash in your gold ETF, you’ll receive the cash equivalent and not the actual gold. If you aren’t afraid of taking risks, try gold exchange-traded notes (ETNs). Gold ETNs are essentially a combination of bonds and gold ETFs. The value is dependent on market index, but they aren’t backed by physical gold in any form. It’s a dangerous game to play, but you could also earn a lot of money. ETNs are flexible, and an investor can trade them long or short, but there is no protection. Keep in mind that while you can potentially earn thousands of dollars, you can lose all your money as well. Gold miner stocks are the riskiest way to invest, since they trade with the broader equity market. Like gold ETNs, this stock option doesn’t come with the secure backing of physical gold; rather, you’re investing in gold mining company stock alone, which is at the mercy of the market. If you still want to give it a try, find a company with strong production and reserve growth. Before trusting them with your money, make sure they have good management and inventory. The easiest way to buy and sell is at your local jewelers. However, there are also companies that allow you to store gold with them and trade metal. You can store physical gold in bank safety deposit boxes or at home, but it’s risky to use any storage facility affiliated with a bank. Also, don’t ask your dealer to store it (any good dealer will refuse). Your best option is an independent depository that offers insured holdings. As with everything, it’s important to do your homework before buying. Research first, and try to find a well-established dealer or stock trader who does large amounts of business at low prices. When choosing a dealer, avoid big premiums. You want to buy gold as close to the spot price as possible. The higher the premium, the higher the gold price will have to rise for you to profit in a long run. Another important thing to consider is dollar-cost averaging, which means putting a fixed amount of money towards gold every month, regardless of the price. It’s a winning strategy you shouldn’t be afraid of–for the average investor, it spreads risk out over time and protects you from losing everything at once.